Last Tuesday we received our first deliveries to Orchard Cottage: organic fruit and vegetable boxes from Riverford organic veg. We’ve been looking forward to participating in an organic box scheme now that we have a patio for people to leave deliveries on. So far, the Riverford boxes do not disappoint. Our first box came with a bunch of info pamphlets (and a good amount of dirt). I tend to glaze over brochures, but one of the pamphlets was actually quite useful. It explained how to plan your meals around the food you receive in the box. Organic boxes are pretty popular in the UK. The US has similar schemes with the CSA (Community Supported Agriculture). Check out their website to search for an organic box delivery near you. That would last us 2 days! It’s nice to have, but it does get very expensive when you’re eating a high raw plant-based diet and supplementing with smoothies. Looks great though! Yeah this wouldn’t work if I was eating raw – the carrot juice alone would cost a fortune. The organic farmer’s market at my old place used to sell big massive juicing carrots in bulk. 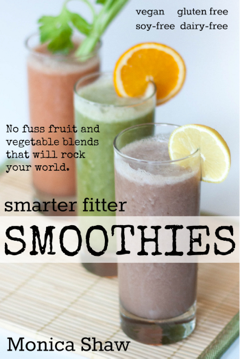 That was way cool… of course, I don’t actually own a juicer, but it’d be nice! Nice work!! We order boxes of organic, local produce too – but we don’t get nifty little pamphlets with them! Can you only get random boxes, or can you choose what you get? Ours does both… I’ve never ordered a random box though and you’ve inspired me to do so! If there’s something new on their list (and I don’t know what it is), I always order it! Hehe. Gotta try new things, right? I know exactly what you mean regarding the expense… We’re a bit poor most of the time, so we tend to order maybe 70-75% of our fruit & veg from our local organic supplier and pick up the extra stuff we need from the market. P.s. Was it you who asked me about what bento boxes I use a while back?? I don’t have any laptop lunch boxes but I know they’re popular. I’m just afraid of anything without a proper lid!! I have a range of kiddie ones (and a few adult ones for my partner) purchased from http://shop.iloveobento.com/ , jbox and ebay! Thanks for the great info! It’s unfortunate how these kinds of things are SO expensive. Sighs. @Nachos – Riverford have a bunch of box options, including “random” boxes, and a “favorites” box where you pick your own. You can also buy stuff by the item. 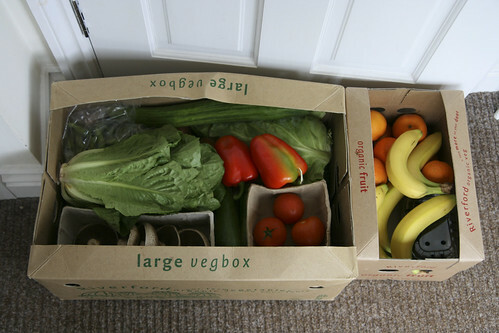 We mix it up with a couple random boxes (one large veg box, one seasonal box, and one fruit box). I like getting new stuff… just today I made broad bean soup for the first time. Never used broan beans much before, but I think they could grow on me (not literally). And I think it was me who asked about the bentos… thanks for the link. I don’t pack a lunch as much as I used to, but when I do, I wish I had a proper bento (would be especially good for plane travel!). @Sagan – Yeah, the expense is kind of a bummer. I guess that’s why you have to sort of pick and choose how organic you’re gonna go without blowing your budget. I just started using a CSA delivery over here in LA and it’s grand. Still trying to figure out whether to get it delivered more often or upgrade to the larger box since we’ve been plowing through them so quickly.